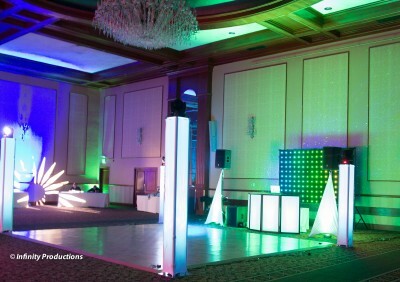 If you are hosting a corporate party, wedding, school dance, birthday party, bat/bar mitzvah adding lighting to the room creates an atmosphere. Not only does it bring life to the room it also sets a mood. It can change a plain wall or column small or large accents to create the atmosphere for your guest taking your event from good, to great! Its a small addition, requires little space for a big bang! 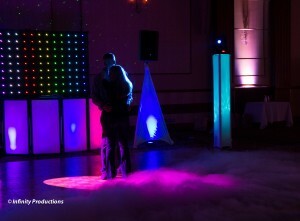 Uplighting is also great for photography during your event. Providing ambient back lighting where you can control the temperature of the room allows your photographer to capture a life filled backdrop behind your pictures. You’ve seen those photo’s with just a plain wall behind them, not much life right? You can change that with tasteful decor to add specific colors that can match the room decor to add that special touch to your event! When you are planning an event, whether it is a wedding, corporate party, mitzvah, birthday, school dance etc, one major part of the planning typically is decor. Now when people traditionally think decor, they focus on linens, flowers, centerpieces, etc. I wanted to take a moment and show how decor and up-lighting should be a part of your planning and included at every event! It is a simple add on that is relatively inexpensive and can do wonders for your decor options.